It’s always amusing to observe responses to my weekly missives. Some readers ascribe statements to me that I’ve not made; some attempt to twist what I say into something never said nor intended; and yet others read between the lines and attempt to tell me what I was really saying but didn’t. I’m a literalist, which means I usually say precisely what I mean, much to my family’s chagrin. There’s enough incertitude and dubiety in the world today that as a literalist, I’m obligated by my own values to not contribute to the untidiness of inference. So when I wrote two weeks ago, “The media’s coverage of the death of Osama bin Laden this past week provided a historic case in duplicity and disingenuousness by both commission and omission,” I meant precisely that, that the media failed to analyze the removal of Osama in light of the present administration’s desire to treat them as American citizens with full access to our judicial system. Osama was not mirandized, no search warrant was issued for Osama’s hideout, and he was executed rather than taken into custody to face a lengthy trial, after being detained at GITMO, which Obama promised to close, and has since reneged on. And when I stated, “In his speech Obama declared, ‘We will be true to the values that make us who we are.’ We seriously must assess what those values are, since so much of what led to Osama’s death presents an ethical conundrum of significant proportions. The media displayed little scrutiny of what exactly those values are.” That likewise was precisely what I meant to say. Nowhere in the piece did I make any judgment call as to the propriety of assisting Osama in his rendezvous with his 72 virgins, as Islamic terrorists believe they do when they die. 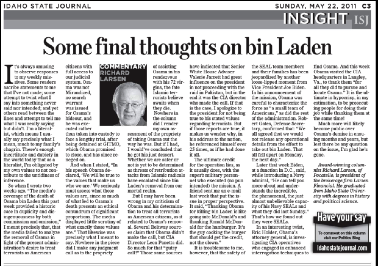 Nowhere in the column did I render my own assessment of the propriety of taking Osama out the way he was. But if had, I would’ve concluded that he got his just desert. Whether we are safer or not is yet to be determined as threats of retribution attacks from Islamic radicals have escalated since Bin Laden’s removal from our mortal realm. But I may have been wrong in my criticism of Obama and his determination to treat all terrorists as American citizens, as it related to Osama’s removal. Several Beltway sources claim that Obama didn’t make the call, but CIA Director Leon Panetta did. So much for that “gutsy call!” Those same sources have indicated that Senior White House Advisor Valerie Jarrett had great influence on the president in not proceeding with the raid in Pakistan, but in the end it was the CIA Director who made the call. If that is the case, I apologize to the president for not being true to his stated values regarding terrorists. But if those reports are true, it makes us wonder why, in his address to the nation, he referenced himself over 25 times, as if he had done it all. Later that week Biden, at a function in D.C. said, while introducing a Navy Admiral, “He can tell you more about and understands the incredible, the phenomenal, the just almost unbelievable capacity of his Navy SEALs and what they did last Sunday.” That’s how we found out they were SEALs. In an interesting twist, Eric Holder, Obama’s Attorney General, is investigating CIA operatives who engaged in enhanced interrogation techniques to find Osama. And this week Obama visited the CIA headquarters in Langley, Virginia to thank them “for all they did to pursue and locate Osama.” It is the ultimate in hypocrisy, in my estimation, to be prosecuting people for doing their job while thanking them at the same time! Much more will likely become public over Osama’s demise in ensuing months and years, but lest there be any question on the issue, I’m glad he’s gone.